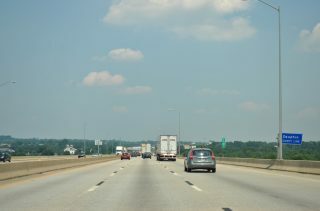 Interstate 81 north at Exit 264 for U.S. 211 at new Market, Virginia. Photo taken 09/23/14. U.S. 211 concludes a 59-mile route from Warrenton, Virginia at Interstate 81. 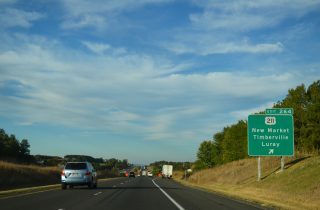 Other U.S. highways ending at an Interstate include U.S. 151 at I-80 near Williamsburg, Iowa, U.S. 641 at I-40 near Holladay, Tennessee and U.S. 189 at I-15 in Provo, Utah. Spanning the Susquehanna River along Interstate 83 north at Harrisburg, Pennsylvania. Photo taken 06/21/12. I-83 was designated in 1960 to replace the short route of U.S. 111 between Harrisburg and Baltimore, Maryland. U.S. 111 was decommissioned in 1963.